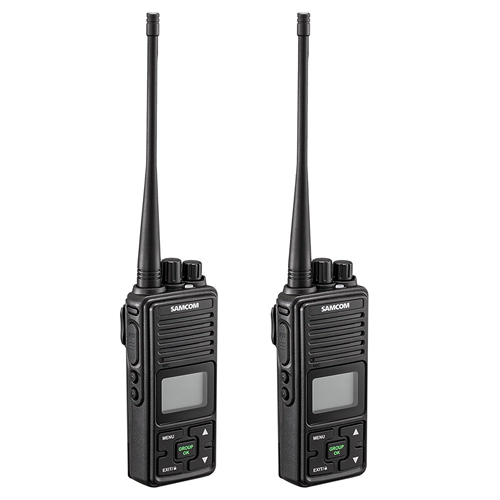 The FPCN10A portable wireless intercom with two-way communication can be added to an existing system of FPCN10A or FTAN20A intercom stations. When installed with multiple intercoms, you can call a specific station or create a group call to reach all stations within the same group. Quick and easy to set up, they’re ideal for security personnel, hunters, warehouse communication, event management teams, construction sites and more. The FPCN10A features super long-range communication, up to 2km between units in a direct line of sight. It has a noise suppression function, allowing for crisp and clear audio. Each unit also comes with a built-in rechargeable long-lasting lithium battery and a charging base. This package comes with two hand-held portable two-way intercoms, two battery packs, two power adapters and cables, two antennae’s and two belt clips.